That’s “Mr. Geek” to You. Con culture. Fandom. Fan art. Fan fic. Even filk. We love it. We're part of it. Heck we even know the difference between Steampunk and Dieselpunk. But we have a few gray hairs, which means we know how to manage projects and do things right. You know that con schedule. The one that uses 6-point type and is as thick as a phone book. You know the one that had the time and room number wrong for the panel you wanted to see? Wouldn't it be great if things could be updated in real time? Now there's an app for that. 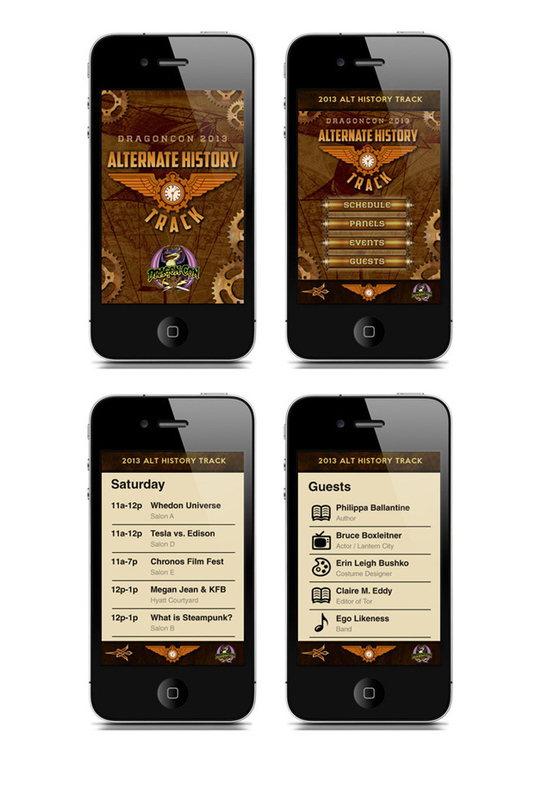 Or at least there is for the Dragon Con Alternate History Track, and we designed it. We've all tried to turn ourselves into a pickle to get out of family counseling, right? OK, maybe just Rick and me. But the next best thing to being a pickle is having a hand-made, life-sized (pickle-sized, actually), Pickle Rick action figure to take on all your inter-dimensional adventures. To make this possible, we put together an animated website for your chance at the big (once again, pickle-sized, actually) prize. We love you too. What happens when the zombie hordes and our favorite characters of The Walking Dead become gummy, 8-inch stop-motion animated puppets? If Robot Chicken is at the wheel, it's bound to be something interesting. 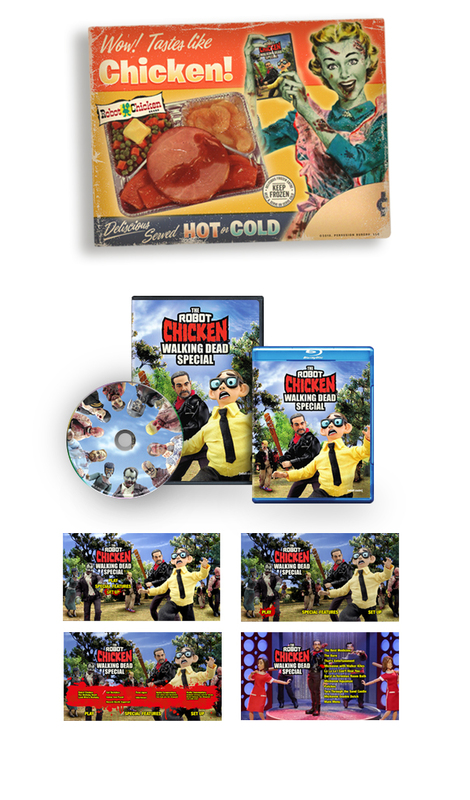 We took the creative direction developed by [adult swim] for the The Robot Chicken Walking Dead Special: Look Who’s Walking marketing campaign as a jumping off point. Then we visually expand upon it making use of the it's inside jokes and buckets of rubbery, stop-motion animated, fake-blood for the final design. Reaching young adults with absurd, irreverent, and bizarre late night programming might sound easy, but explaining why it's cool to adults, not so much. Sure rating help, but getting marketers/advertisers on the same page using the irreverant on-air tone can be challenging. But we got this. We've created B2B marketing materials as well as consumer facing marketing and products that make both sides join hands and sing "Kumbaya." Some people say we get it. I guess we do. Some ask us what our secret is. To be honest, there isn't one, unless "secret" means listening to clients and immersing yourself in their brand. Who would have thought whimsical adventures about a geeky boy in a silly hat and his talking-dog best friend would have become what it is. But that's fandom. In some ways pop-culture fandom is the opposite of sports-ball fandom, but we’ve been told there is a Venn Diagram that explains the bizarre (six-fingered) love child where they overlap. 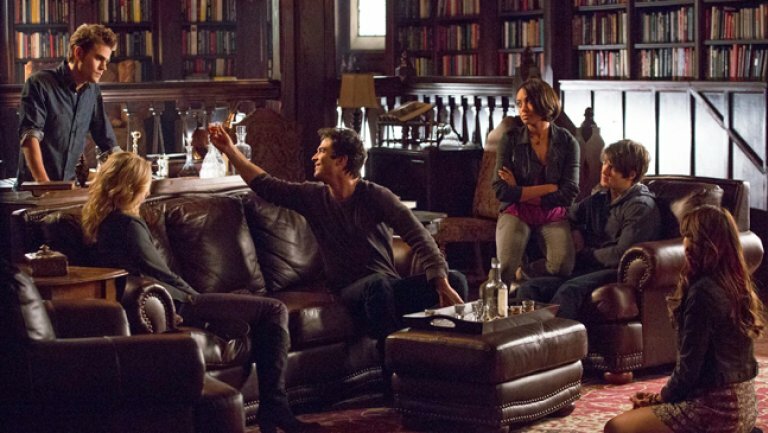 Fandom permeates pop-culture "cons" with a blend of personal creativity and adulation of geeky pop-culture characters. We go to those. Not as Star Trek away teams to do an anthropological study of the culture, but as actual fans. 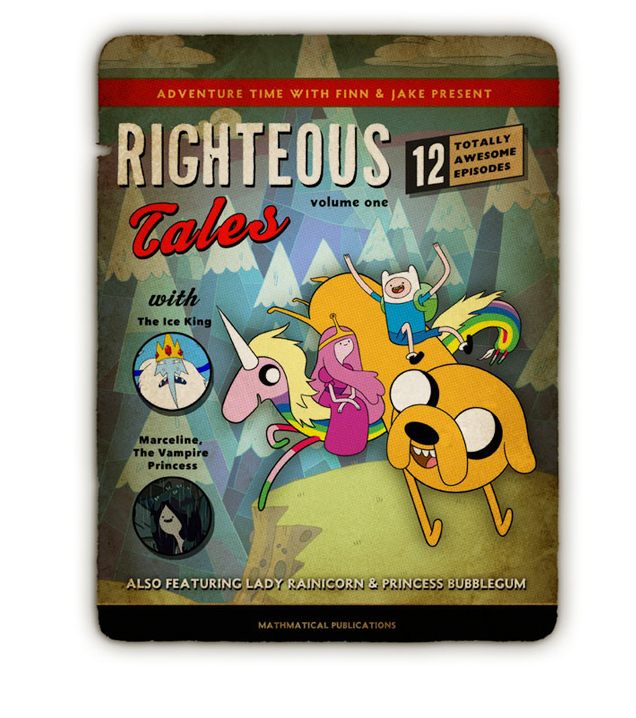 We're fans of fandom, fans of many of the fandom franchises, and fans of fans. How meta is that? For three years we've animated and built Adult Swim's Comic-Con website. In 2018 we raised the bar to include design and management of a daily email camapign so Comic-Con attendees could stay up to date with all that is Adult Swim. Welcome to geek Nirvana, pop-culture Mecca, cosplay Xanadu. Otherwise known as San Diego Comic-Con International. 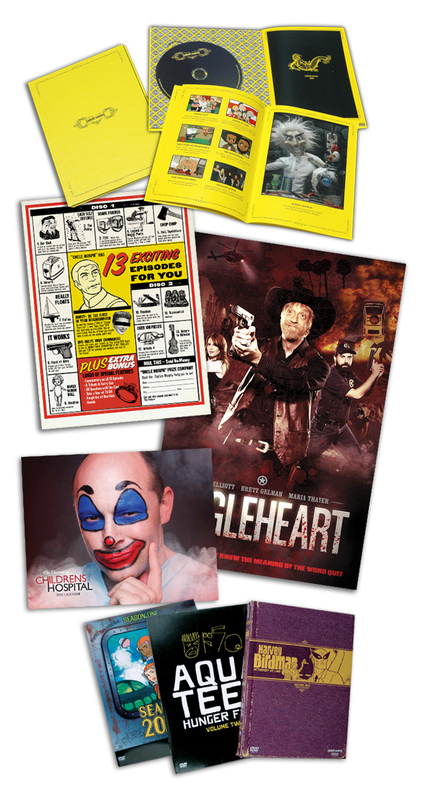 For over 10 years we've been helping folks like Warner Bros., DC Comics, Cartoon Network, and most recently Adult Swim connect with their audiences through unique branded ComicCon promotions and websites. If you want to know what Steampunk is imagine the 21st century, except that the gasoline engine never quite caught on. Now throw in a generous mix of Jules Verne, Georges Méliès, the Tesla/Edison rivalry, fancy men in waistcoats, gun-slinging women in corsets, and airships. Lots of airships. If you can do that, you're more than halfway there. But don't worry, we can help you the rest of the way. Cheerio. Past versions of the DC Comics Superman style guides were simple brochures. For the new version, DC comics hired us to do something special. 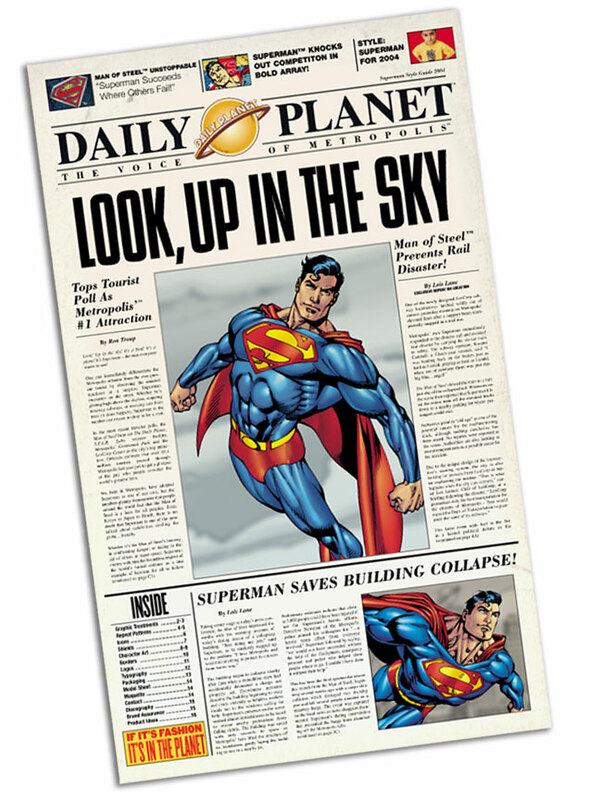 Our solution was to create a large style guide based on the "Daily Planet," the newspaper where Clark Kent works. When we're not pushing pixels around, we like to get our hands dirty. We've created props for TV, custom-made boxes for marketing promotions, and installations for client events. 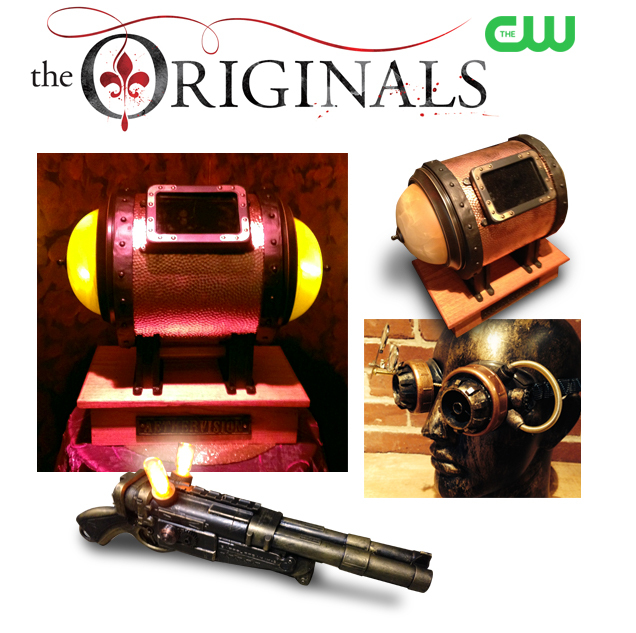 For "The Vampire Diaries" spin-off "The Originals" we created steampunk background props for the set.